In this 50 minute program, Joe Porcelli demonstrates 25 fantastic time saving tips that will make any stained glass project easier and more efficient. Joe has taken the most popular glass cutting, foiling and soldering tips from his years of workshop experience and put them into this hands-on video. Bound to be a best seller among glass craftspeople of any skill level, this video is the latest release from one of the glass industry's most sought after instructors. The Copper Foil Method seems to be the only method anybody teaches. Finding a good resource for Lead Came instruction has been next to impossible ... until now. Too many instructors and "how to" books gloss over this important aspect of stained glass, but not Tommy G. You'll get everything you need to know demonstrated in full color. 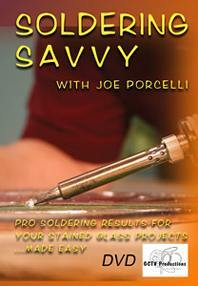 SOLDERING SAVVY with Joe Porcelli (#29312-D) has 60 minutes of demonstrations, tips and tricks for the perfect solder bead. Joe has been a master of the copper foil technique for decades and you get the benefit of his vast experience in this DVD. more! 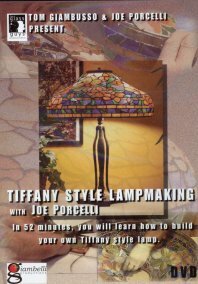 In 52 minutes Joe takes you from pattern to finished lamp. Build your own Glass Mosaic Masterpiece! 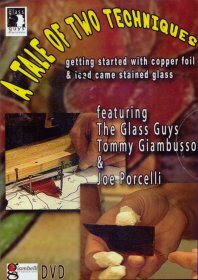 MOSAICS with the Glass Guys (#29311-D) Join The Glass Guys, Tommy "G" Giambusso and Joe Porcelli as they show you how to design and build great mosaics. Watch these 2 top instructor transform a simple tabletop into a beautiful Aztec Sun Stone mosaic. Includes Bonus mosaic repair techniques.